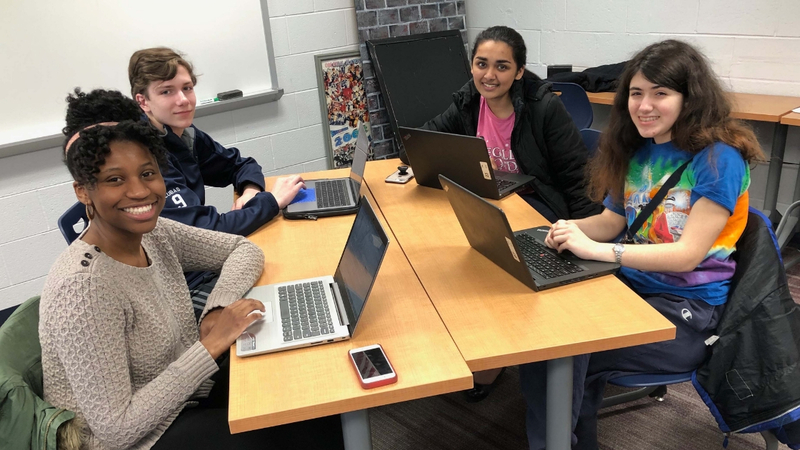 Plymouth Whitemarsh High School (PWHS) reworked its introductory courses in computer science to encourage more girls to take the class. For this effort, the school has earned its first College Board AP® Computer Science Female Diversity Award for achieving high female representation in AP (Advanced Placement) Computer Science Principles. Plymouth Whitemarsh High School has four courses in the computer science track: Computer Science 1: Web Design and Animation, Honors Computer Science 2: Web Apps and Games, AP Computer Science and AP Computer Science Principles. The computer science classes offered at PWHS are Dual Enrollment, which means that a student who takes all four classes can graduate from PWHS with 15 college credits from Montgomery County Community College. To receive the AP Computer Science Female Diversity Award, schools must have either 50% or higher female representation in one of the two AP computer science courses or a percentage of the female computer science examinees meeting or exceeding that of the school’s female population. PWHS is one of only 490 schools — out of more than 18,000 secondary schools worldwide that offer AP courses — to earn the AP Computer Science Female Diversity Award for AP Computer Science Principles.